Lately Aphex Twin has been at the center of a whirlwind of activity that, to date, has included the release of two brand spanking new edits of “Avril 14th,” and an ensuing original single dubbed “Mangle 11.” To further fan the Aphex flames, the producer, born Richard David James, also announced a series of upcoming live performances, signaling his return to the festival circuit in 2019. 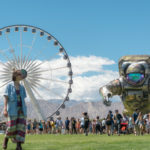 Aphex Twin notably graces Coachella’s 2019 lineup, and will also handle headlining duties alongside Massive Attack at Mexico City’s Ceremonia Festival in April. 2019 is evidently shaping up to be a big year for Aphex Twin, with his recent nomination for a 2019 BRIT Award. Aphex will vie with fellow nominees Craig David, George Ezra, Giggs, and Sam Smith for the BRIT award for “Best Male Solo Artist.” The third time might just prove a charm for Aphex Twin, who previously received nods in the same category in 2002 and 2016. The 2019 BRIT Awards will take place on February 20 at The O2 in London. The Collapse producer is also preparing to perform in New York City for the first time in 20 years. The acclaimed electronic entity will close the gap between his last live performance in New York during the 1990’s and 2019 at Avant Gardner in Brooklyn. Slated for April 11, the show will also mark Aphex Twin’s first appearance in the US since his set at Houston’s Day For Night festival in 2016. Tickets to Aphex Twin’s Avant Gardner show will go on sale January 18 at 10 AM EST, here.